A Liberal's Libretto: Vocal Guru Richard Miller Has Died. Vocal Guru Richard Miller Has Died. 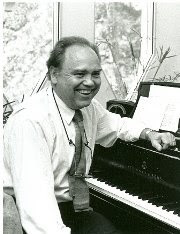 Oberlin Conservatory is reporting that noted vocal guru Richard Miller died on May 5th. "It is impossible to capture in words the significance of Richard's contribution to the field of music as an artist, teacher, and mentor; it was utterly extraordinary." Many of Miller's students have continually sung on some of the greatest stages in the world. It is fair to say that his approach to teaching has been well documented and his methods have shaped the curricula of private teachers and conservatories throughout the world. An adjunct staff member in the Cleveland Clinic Foundation's Otolaryngology, Head, and Neck Surgery Department, an associate of Collegium Medicorum Theatri, and a member of the American Academy of Teachers of Singing, Richard was a frequent adjudicator for vocal performance competitions around the world. He wrote eight books on the subject of singing including that which many have deemed the "singer's bible" - The Structure of Singing. In addition, Miller wrote more than 100 articles on voice pedagogy research and performance. Miller founded Oberlin's Otto B. Schoepfle Vocal Arts Center. The first of its kind to be based in a music school, the acoustic laboratory measures vocal production and provides visual and auditory feedback to the singer. He was honored many times for his contributions to the profession. He won the Voice Foundation of America's Voice Education Research and Awareness Award in 2006, the New York Singing Teachers Association's Recognition Award for Excellence in Teaching in 2002, and was honored with the French Ministry of Culture's Chevalier/Officier, L'Ordre des Arts et des Lettres in 1990.